RPS-150A Self Contained Ultrasonic Sensor - Deeter Electronics Ltd. RPS-150A Self Contained Ultrasonic Sensor - Deeter Electronics Ltd. Range 2 to 40", or 5 to 80"
The RPS-150A analog ultrasonic sensor is mounted in a limit switch style housing and is completely self contained. It is powered by 20-30VDC, and is reverse polarity protected. It also has a wide beam angle which enables it to detect a target that is not at right angles. A flat target can tilt up to 35 degrees and still be detected. 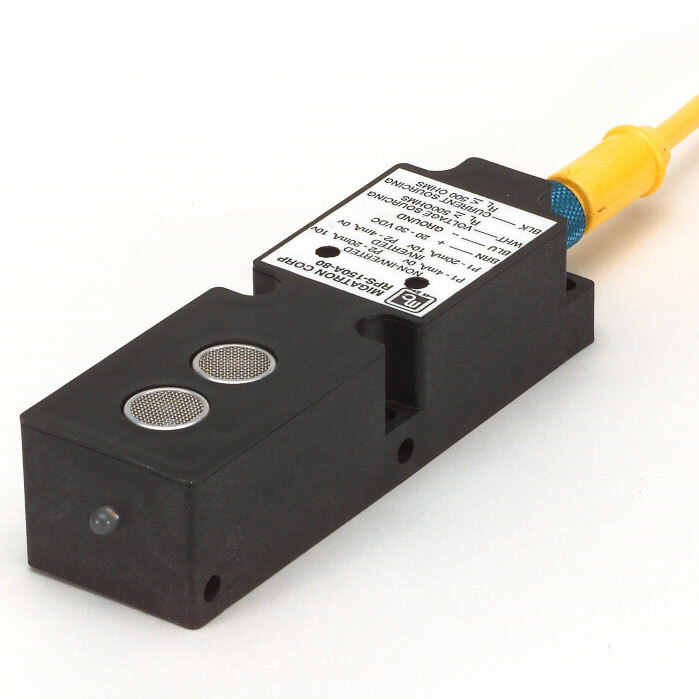 The RPS-150A has 2 short circuit protected analog outputs, 4-20mA and 0-10VDC. These outputs can easily be inverted and can be scaled over almost any range by means of adjusting the zero & span control. For set-up purposes an LED signal strength indicator is provided. The RPS-150A ultrasonic sensors can be used as level control devices for liquid level and bulk materials. This LED is green when not detecting and fades to RED as a target moves into place, depending on how much reflected signal is coming back from the target. The frequency of operation is 38.5kHz. There are two ranges available in this model 2" to 40" or 5" to 80". It also features a quick disconnect receptacle. The housing is constructed of plastic valox and has standard 30mm X 60mm limit switch mounting dimensions as well as side holes for mounting the sensor on its side. Analog sensing in the Minimum sensing configuration means detecting an object over a 5" range with the RPS-150A-40. This 5" span can be adjusted to occur over any part of the sensors range. For example, it could be adjusted to occur from 10" to 15" or 25" to 30". This is done by means of the two potentiometers on the sensor. This sensor has a 5 : 1 adjustment ratio on its analog output, meaning that the RPS-150A-40 has a maximum span of 38" (range 2" to 40"). The analog output can also be adjusted anywhere between the 5" and 38" spans. These adjustments are made by the two potentiometers on the sensor. With no more then two adjustments of each potentiometer, the desired range will be achieved. Analog sensing in the Maximum ranging configuration means detecting an object over a 38" range with the RPS-150A-40. This 38" span goes from the sensors minimum sensing distance 2" to its maximum sensing distance 40". The adjustment procedure is the same as described in the minimum analog ranging section. The RPS-150A-80 in the maximum ranging configuration detects an object over a 75" range. This span goes from the sensors minimum sensing distance of 5" to its maximum sensing distance of 80". This sensor also has a 5 : 1 adjustment ratio on its analog output so its minimum analog ranging capability is a span of 12". These adjustments are made by the two potentiometers on the sensor. The RPS-150A has the ability to invert its analog outputs, meaning that the current or voltage will decrease with distance. For the current output to be inverted the voltage output needs to be tied to the positive of the supply voltage of the sensor. This then will invert the current output to 20mA – 4mA. To make the voltage output inverted 10v – 0v the current output needs to be tied to the positive of the supply voltage. In the standard mode of operation (non-inverted) P1 adjusts the near point 4mA (0v) and P2 adjusts the far point 20mA (10v). In the non-standard mode of operation (inverted) P1 adjusts the near point 20mA (10v) and P2 adjusts the far point 4mA (0v). Operational Range: Adjustable 2" to 40"
Response Time: 2" to 40" 5" to 80"